Get your bowls, wooden spoons and flour ready, it’s National Baking Week! This important british initiative was set up to celebrate good old baking and to raise vital funds for charity. All the better reasons to grab your ingredients , make these delicious Pumpkin Chocolate Chip Muffins and celebrate the joy of baking. When the lovely team at HomeSense asked me to put together a nice fall recipe to celebrate National Baking Week, I jumped for joy! First, I love any national food-related week or day, in fact I’ve celebrated chocolate week with you all just few days ago. Second, I’m totally obsessed with HomeSense, it’s one of the places where I usually spend most of my time -and money- when I go shopping. Everytime I go shopping at HomeSense I feel like a kid in a candy shop with very little self-control. From the home decor to the kitchen section, I could -and I do- spend hours browsing and hunting for little treasures. This time I managed to bring home some of the cutest things ever, including a light turquoise ceramic muffin tin, two coordinated ceramic bowls, a charming white wood tray, a couple of lovely lavender kitchen cloths, a beautiful cake stand, and some evergreen utensils such as spatulas and whiskers. One of the reasons I love shopping at HomeSense is their gourmet food department. They have great products are such bargain prices! 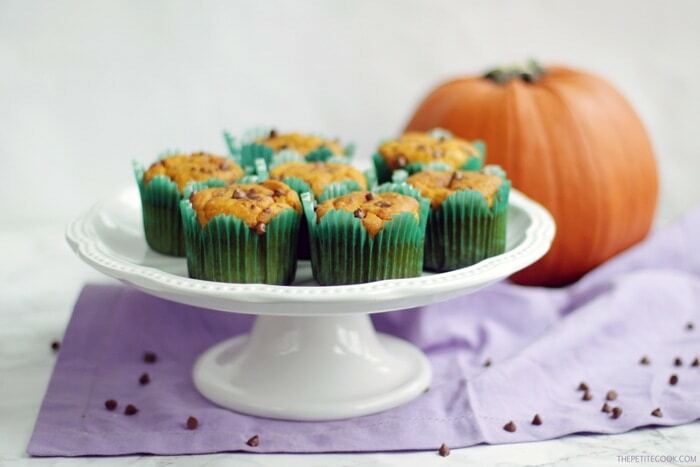 I couldn’t help but grab some vanilla pods ( so much better than vanilla extract) and cinnamon, two of the star ingredients of these delicious Pumpkin Chocolate Chip muffins. Light and tender, with warm fall spices and indulging chocolate in every single bite, these incredibly easy-to-make pumpkin muffins are the perfect way to celebrate National Baking Week or any other ordinary day if you ask me. Whether you make them for breakfast, party or dessert these guys are super satisfying and sure to be a crowd-pleaser. These moist low-fat muffins are a breeze to make and only require 2 bowls and a muffin tin, plus they are ready in just 20 minutes. 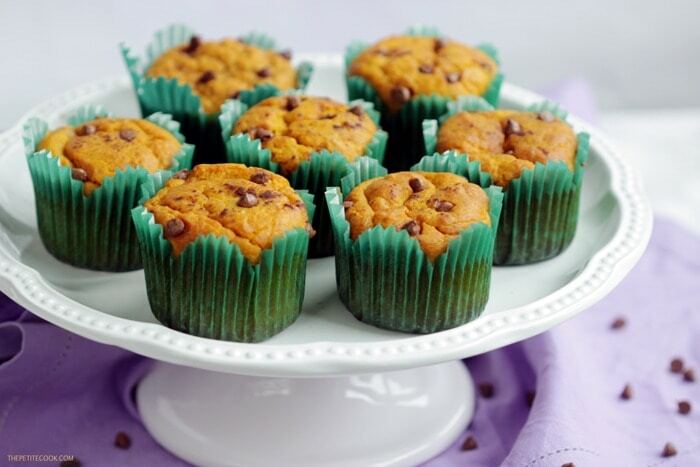 Before you know it, you’ll be indulging in warm, freshly baked pumpkin chocolate chip muffins that melt in your mouth. 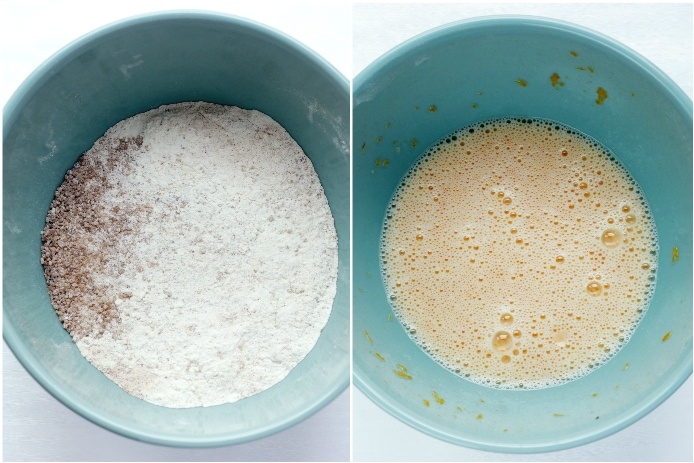 Start by putting dry ingredients in a bowl and wet ingredients in another. Then mix everything together, making sure to not over mix the batter. 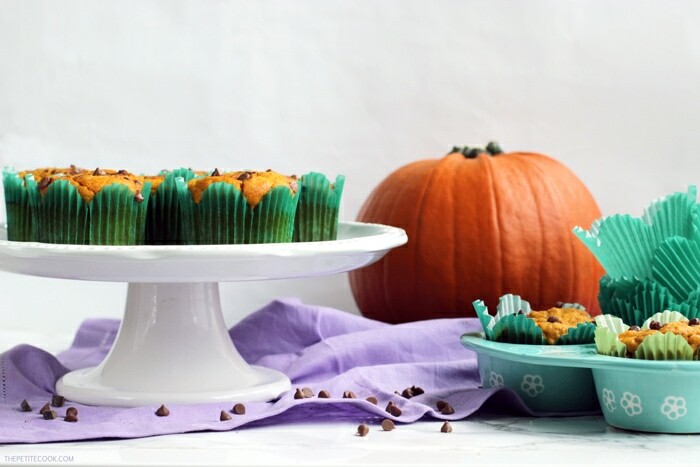 Finally, pour the delicious pumpkin batter into your muffin tin, filling each mould almost all the way to the top. Bake in the oven for 15 mins or until a toothpick inserted in the center comes out clean. Then wait about five minutes to allow the muffins to cool down before devouring them up! To get the best muffins ever, remember to not over mix the batter and not over bake. Otherwise you’ll end up with dry, dense muffins. And that’s definitely not what you want. So give it just a quick mix and keep an eye on the timer. 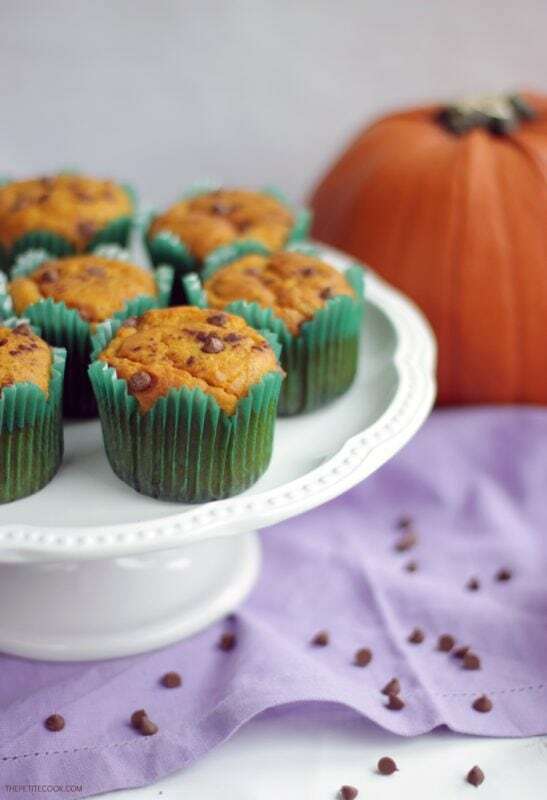 Pumpkin Chocolate Chip Muffins bake beautifully and really require little effort on your part. Moist and tender, with a rich pumpkin flavor perfectly complemented by cinnamon and spices. 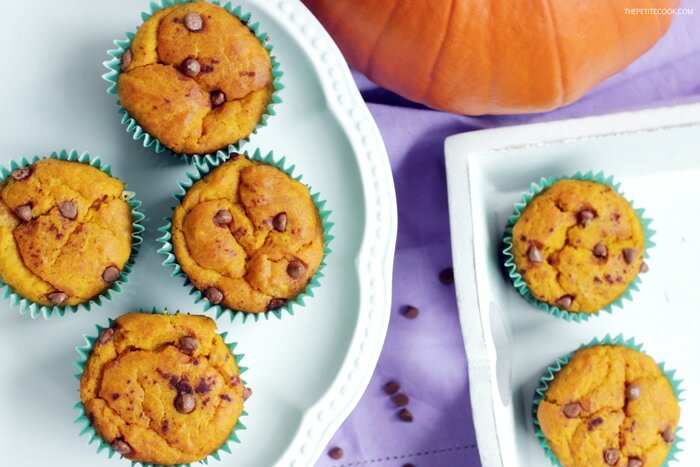 If you like all things pumpkin, these are the perfect muffins for you! I really hope you try these delicious pumpkin muffins. If you do, please leave a comment below and let me know how you enjoyed it, and what are your favorite muffin recipes. And don’t forget to snap a picture, tag it #thepetitecook and share it with me on Instagram! Pre-heat oven to 180C/1 60C fan/ 375F. In a large bowl, beat the eggs, sugar, pumpkin puree and oil until smooth. In another bowl combine the flour, pumpkin pie spice,, cinnamon, salt and baking powder. Slowly incorporate the dry ingredients with wet ones, making sure of not over mixing. Divide the mixture into a non-stick muffin tin folded with paper cases, filling each mould ¾ to almost all the way to the top. Bake for 15-20 min or until a skewer comes out clean. Cool in the tin for 10 mins then serve. Store in an airtight container for up to three days. 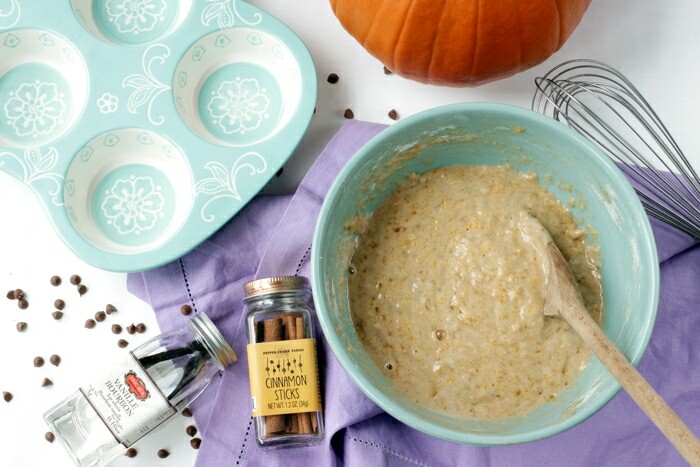 You can also make your own pumpkin spice mix. 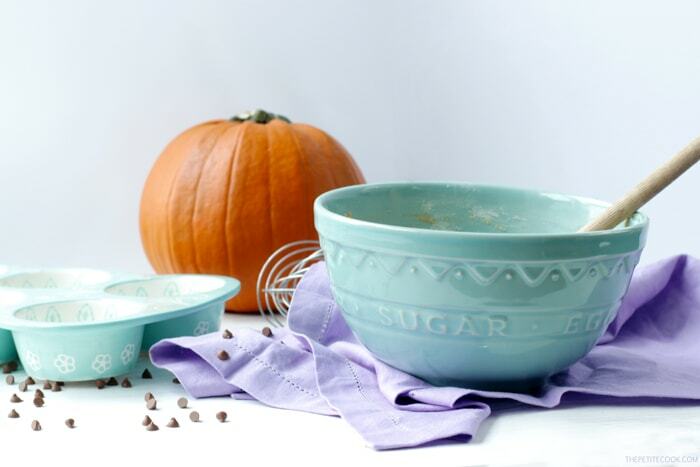 1 tbsp pumpkin spice mix: 1½ teaspoons cinnamon, ½ teaspoon nutmeg, ½ teaspoon ginger, ¼ teaspoon allspice. This post is sponsored by HomeSense. All the products present in the shooting were purchased at HomeSense and may be available at your local store. All opinions are my own as always, and yes, I’m truly obsessed with HomeSense. Thank you for supporting the brands that support The Petite Cook! This recipe is perfect for the Holidays. I can make this as a giveaways for my friends and family. This is not only delicious but healthy too. Perfect for kids. Thank you for sharing. I will Prepare these lovely and also different holiday baskets I’ve collaborated again with Homesense. I’m type of stressed with this shop.